I'm back from my trip to UK. In fact, I was back since the beginning of August. I was just overwhelmed with work and I'm a bit behind with my research, so I'm catching up slowly... I also get distracted by the numerous summer activities and events in Montreal. 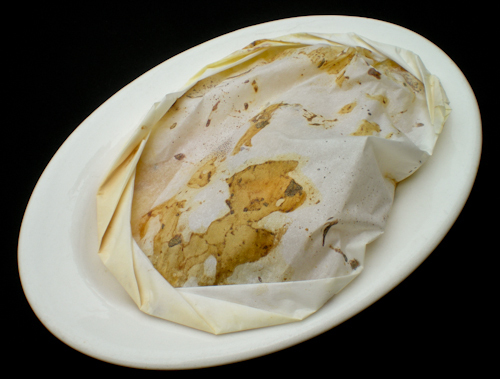 If you visited Montreal, you would understand why...I received numerous e-mails and tweets about when I'll be publishing my next recipe. I have been pressured quite a lot by co-workers too, so you're not the only ones... I'm so fortunate to have such loyal viewers and I greatly appreciate it. The Highlands of Scotland in a nice sunny day. You might wonder what I did in my three-week vacation in the UK. I visited over 30 cities which includes Wales, England, Scotland & The Highlands. When I'm in a foreign country, I hunt for the best places to eat and acquire as much knowledge about their food culture. Expect some posts about my food adventures in the following weeks. I received a request a week ago from my brother's friend who wants me to make a salmon dish which is savory and, at the same time, original. 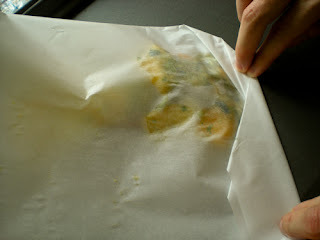 When I deal with salmon, I immediately think of "en papillote", a classic French cooking technique in which the fish is steamed inside a sealed pouch with fresh herbs, seasonings and aromatics. My favourite marriage of ingredients is maple syrup, ginger and lime which gives a contrast of sweet, tangy and citrus flavour to your dish. Simply licking your mixing bowl, you'll be amazed of this combination. 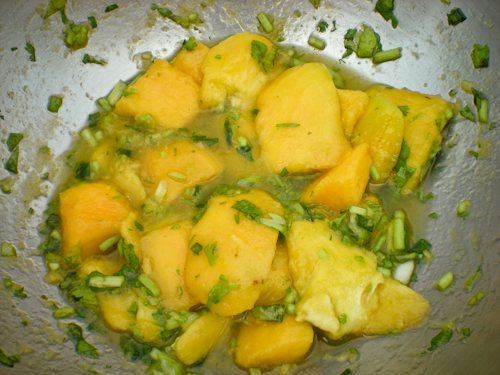 I added some mango and coriander for some freshness to the salmon. What is your favourite salmon dish? If you have already published a salmon recipe on your blog, feel free to post your link on the comment section. I would love to read it! Note: I presented both ways to make a pouch. Both methods are as good, I didn't see any difference in terms of doneness and flavors. 2. In a medium bowl, mix maple syrup, ginger, lime juice, coriander and scallion. 3. Add in the mangoes and, with a spoon, gently coat the mangoes with syrup mixture. 4. Cut parchment paper in a heart shape. Add a tsp of olive oil in the middle of one side of the heart. 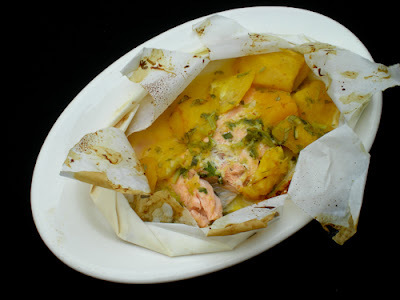 Place the salmon skin side down, add 1/4 of the mango garnish on top of the salmon. Fold the other half of the paper, starting from one end of the heart, crimp the open edges to seal them by making a series of small folds. 4. 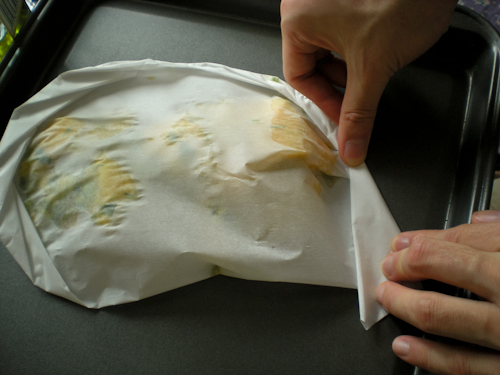 Lay a foot-long parchment paper. Repeat the above process for the salmon. The pouch should look like a calzone. 5. 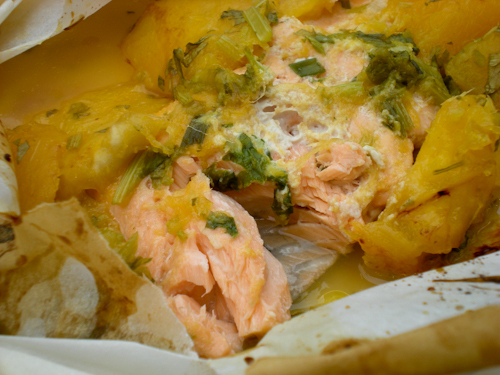 Place salmon pouches on a baking pan and bake for 15-18 mins. 6. To serve, place the pouches on serving plates, and let each person cut open his or her own pouch. Bon apétit! Welcome back, Victor! Laurent and I have been discussing visiting the UK, and you certainly make it sound (and look) appealing. Looking forward to reading more about your trip. The fish looks great, I love the papillote method. I like salmon in many forms, but one of my favourite versions is baked, then topped with a creamy dill sauce and a side of spinach. 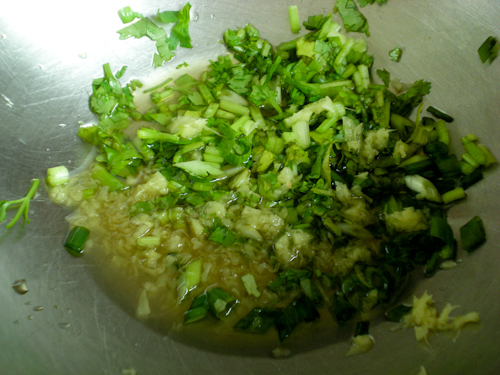 Or basted in teriyaki sauce, coated in coriander seeds and schezuan pepper, and briefly seized in the pan. Yum! Other than a simple saute, my absolutely favorite salmon is as gravlax. Oh how lucky to enjoy such a great trip. Love the pics! 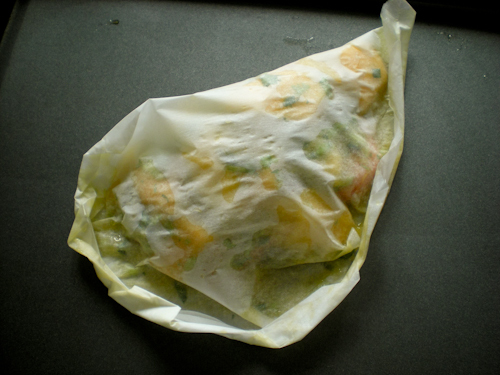 And love your exotic twist on this papillote. This is a lovely dish. It is good to hear you enjoyed your holiday and are enjoying what is left of summer. I hope you have a great day. Blessings...Mary. Nice to have you back! A holiday could be very tiring, fun though. I love this baked salmon wrapped in paper...very fresh and delicious. Seems u had a wonderful holiday,glad to see u back..Salmon in papillote looks super delicious.. I bet the fish was so tender and flavorful. Great recipe. Wonderful recipe, Victor! I've never cooked salmon in this method but it must be delicious. Salmon is my favorite fish. Feel no pressure! You have been very busy so come back with ease. Wonderful photos! Looking forward to some trip details. I was just in Scandinavia for three weeks in July, so I know how it is to be inspired by travels! Wow.It looks so yummy!Delicious flavor combination.. I have to make it one day..thanks for sharing the recipe.. Welcome back, Victor! Scotland's countryside looks so beautiful! Your salmon looks delicious and so flavourful! The addition of mangoes is so creative of you! And I like the second method of wrapping up the salmon, looks like a big calzone! Have a lovely weekend! Nice one with the mangoes Victor, been so long we caught up and have been seeing you are busy with your studies, am looking forward to your baking skills,esp your lovely desserts. 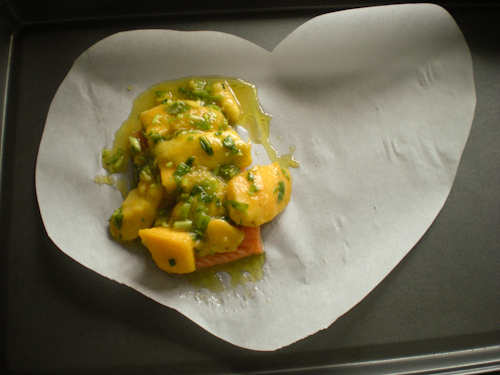 Salmon, mangoes and maple... sounds to be a very new, interesting and sweet combo. Thanks for sharing. I haven't tried those flavours with salmon yet - but I'll have to soon. Pity you didn't get over the Irish Sea to visit us .... maybe next time! haha, UK is so large, I wish I could stay more than 3 weeks, I would have visited Ireland. I definitely give you a shout if I pass by Ireland. Victor..nice to meet you..We eat salmon so often..I like this recipe..Did you see Loblaw's now carries papillottes? I read about them in the most recent Ricardo magazine..
@La Table De Nana Nice to meet you too, I wasn't aware about this in Loblaws. Thanks for the info. I have never tried salmon with mango, sounds like an interesting combination. Mango and ginger certainly is. Cool, Rebecca! Let me know how it turns out. Lovely recipe! Sophisticated and refreshing... Yummy! And this salmon dish is definitely elegant - I love the presentation. Next time I make salmon, I'll definitely be thinking of trying it this way! Now this salmon dish looks beautiful! I like how you cut the paper into a heart shape first. Very clever idea. I would never thought of cooking salmon with mango. Totally blew me away! Nice job! hi victor! nice to hear from you again! sure you have put on much weight after the trip! Hope you're doing fine with all your work now. The citrus flavours here sound delicious, once again you have well demonstrated your cooking creativity and skills. 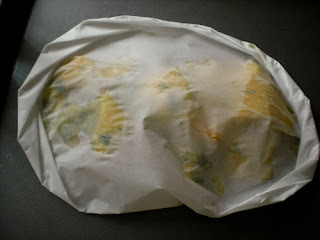 no salmon post in my blog but a there's a pasta en papillote which i posted few weeks back. Hi again, Victor! Sure it'd be fun to meet up and hear about your trip! But I thought you were in Ottawa now? Welcome back Victor! Love the pictures.. I am so jealous!! !